Join UMSON Staff and Faculty Members in one or more community engagement opportunities. See details and RSVP under "Volunteer Opportunities" below. The UMSON Staff Council provides a forum where staff can address and discuss issues that are important to them. ‌The Staff Council acts as an advisory council to the dean and the administration to share concerns. Staff Council promotes professional development through seminars and programs to enhance the personal well-being of staff. Additionally, Staff Council fosters a spirit of cooperation, professionalism, and integrity with a dedication to honest and open communication. The Staff Council serves as a channel of communication to the dean in the areas of policy and procedures that affect the quality of the staff's work life and their level of contribution to the strategic goals of the campus. The Staff Senate was begun in 1994 and since has researched many areas of concern for staff members. Meetings are held the third Wednesday of every month from 10-11 a.m. in Room 435. All staff members are welcome to attend. Access these materials with an UMSON username and password on the Staff Council Intranet page. 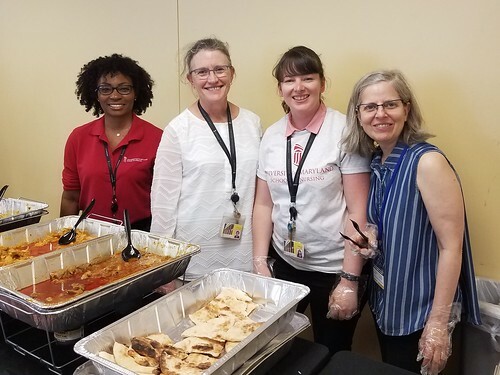 Note: Through the UMB Employee Volunteer Initiative, the University of Maryland, Baltimore will allow full-time faculty and staff to use four hours of paid leave if they wish to volunteer at a qualifying nonprofit organization of their choice. Help with hot lunch service and working in the clothing bank. This experience includes a tour of Paul’s Place, and the opportunity to learn more about their many programs serving the southwest Baltimore community. If you have questions, contact Sarah Hokenmaier at shokenmaier@umaryland.edu. The semiannual Staff Excellence Award recognizes excellence among staff of the University of Maryland School of Nursing. Learn more and nominate a staff member.